Presentation: “Against Immersion: Towards a discursive situation in media art”, inSonic2017, ZKM Karlsruhe, December 2017. Workshop: Hyper-listening: Praxis, inSonic2017, ZKM Karlsruhe, December 2017. Publication: The World Within the Home: Tracing the Sound in Satyajit Ray’s Films. Music, Sound, and the Moving Image 11/2: 131 – 156. Liverpool University Press. Publication: “Beyond Matter: Object-disoriented Sound Art.” Seismograf/DMT (special issue: Sound Art Matters), November 2017. Publication. “Reconstructing Atmospheres: Ambient Sound in Film and Media Production.” Communication and the Public 2/4: 352 – 364. London: SAGE Publication. 2017. Exhibition: Resonating Field (from Decomposing Landscape), Quartair Contemporary Art Initiatives, The Hague, November 2017. Exhibition: Exile and Other Syndromes, Rogaland Kunstsenter/Screen City Biennial, October 2017. Exhibition: Talking Frame, ZKM Karlsruhe, September 2017. Presentation: “Expanded Object: Rereading the History of Sound Art”, ISACS17 – Resonant Worlds: Sound, Art & Science, ZKM Karlsruhe, 28 – 30 September 2017. Live act: Nacht van Kunst & Kennis, Leiden, September 2017. New essay: Against Immersion, Sonic Field, August 2017. Broadcast: documenta14 (public radio), July 2017. New release on Vinyl: Elements Songcycle, June 2017. Exhibition and presentation: “Decomposing Landscape“, ISEA2017, Manizales, June 2017. Concert intervention: SPEKTRUM Berlin, June 2017. Concert and publication: University of Applied Arts Vienna, May 2017. Solo concert: “Listening and its discontents“, Alte Feuerwache, Köln, May 2017. 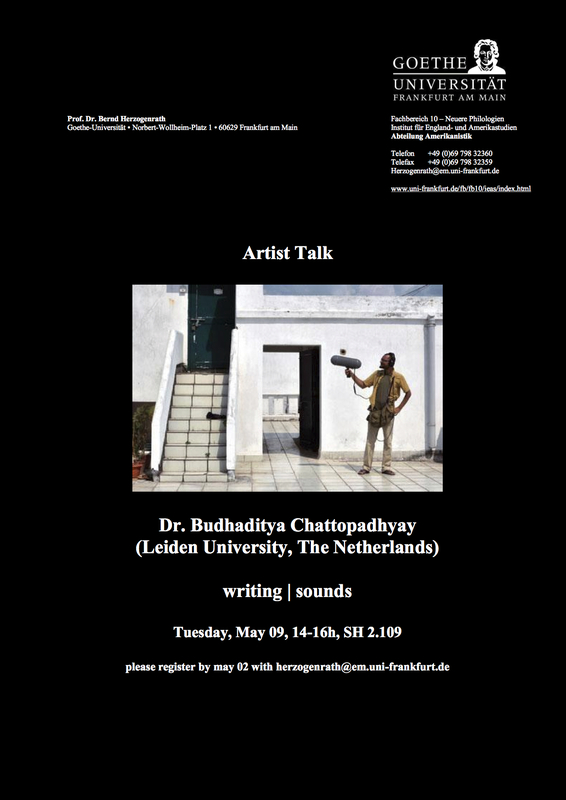 Artist’s talk: Goethe University Frankfurt, May 2017. Publication: “Talking Field: Listening to the Troubled Site.” Journal for Artistic Research 13, April 2017. Lecture-concert/artistic presentation: The Hague, March 2017. Artists’ talk, Gujral Foundation/The Creative Community, New Delhi, December 2016. Presentation: “Audible Absence: Ambient Sound in Practice,” International Conference: Sonologia 2016: Out of Phase, São Paulo, November 2016. Performative reading: “A Nomad’s Guide to Listening“, Errant Sound, Berlin, October 2016. Artists’ talk and live concert performances in Kaunas and Vilnius, Lithuania, October 2016. Talk: “Breaking the Wall of Sound“, Falling Walls Lab, Aarhus University, September 2016. Publication: “Endnotes on the Margin of Listening”, in Dirty Ear Report #1, Berlin: Errant Bodies Press, September 2016. Workshop: “Hyper-listening: Praxis“, University of Applied Arts Vienna, September 2016. Release: Wandering Shadows of Sound, Impulsive Habitat, August 2016. Arithmetic of Distance in Helicotrema Festival 2016. Publication: “Being There: Evocation of the Site in Contemporary Indian Cinema”, Journal of Sonic Studies 12, Leiden University Press, July 2016. Publication: “Émergence de nouvelles conceptions sonores”, Paris: Presses Sorbonne Nouvelle, June 2016. Presentation: “Beyond Matter: Object-disoriented Sound Art“, Sound Art Matters Conference, Aarhus, June 2016. Artist in residence, Q-O2, Brussels, April 2016. Solo exhibition: Passage to the City, The Auricle Sonic Arts Gallery, Christchurch, 3 – 31 March 2016. Concert performance: Vorspiel 2016, transmediale, Berlin, January 2016. Premiere: Exile and Other Syndromes, IEM, Kunstuniversität Graz, January 2016. Talk: Object-disoriented Sound: Poetic Intervention in Listening and Meaning-making, IEM, Kunstuniversität Graz, January 2016. Exhibition: A Day in the Life of a Listener, ‘Listenings‘, Museo de Arte Moderno de Medellín, December 2015 – March 2016. Award: audiot (shortlisted), Dot Award, New Media Writing Prize, London, January 2016. Screening: Talking Field (shortlisted for the inaugural Sluice Screens Prize 2015), Sluice Screens, London, December 2015 – January 2016. Conference presentation: ‘Writing on Sound/Writing with Sound‘, Media Art History Re-CREATE 2015, UQAM and Hexagram, Montréal, November 2015. Talk: ‘Auditory Situation and Contextual Listening‘, Kunstuniversität Graz, October 2015. Publication: ‘Auditory (Con)texts: Writing on Sound‘. Ear │ Wave │ Event # 2. May 2015. Live performance: Touch live at Donau Festival, Krems, May 2015. Live show, SPEKTRUM, Berlin, August 2015. Concert performance: Sonorities Festival 2015, Belfast, April 2015. Release: Decomposing Landscape, Touch, March 2015. Publication: ‘The auditory spectacle‘, The New Soundtrack, Edinburgh University Press, March 2015. New piece for radio, commissioned by RRS Museo Reina Sofía Radio, November 2014. First prize, Computer and Electronic Music, Computer Space festival, Sofia, 2014. Live performance at TodaysArt, Wonderwerp, Den Haag, 24 September 2014. Solo performance at Nikolaj Kunsthal, Copenhagen, 18 September 2014. Panel at ESSA2014, sound studies conference, Copenhagen, June 2014. New release: A Day in the Life of a Listener, Gruenrekorder, May 2014.
essay appears in NY Arts Magazine, April 2014. Publication: ‘Object-disoriented Sound‘, APRJA, volume 3, issue 1, March 2014. Artist in Residence, ICST, Zurich University of the Arts (ZHdK), Jan-Feb 2014. Presentation: ‘Audible Evidence’ at Visible Evidence 21, New Delhi, Dec 14, 2014. Solo performance at Leth and Gori, Copenhagen, August 2014. A table is a table (pilot project), installation for sound and found objects at ‘Fringes Form’, Nålen, Copenhagen, July 2014. Talk at Holbæk Kunsthøjskole, Denmark, 23 July 2014. Live show at Dansk Standardpoesi, Vejen Kunstmuseum, 11 May 2014. Talk: sound’s visuality, Overgaden Institute of Contemporary Art, Copenhagen, 8 May 2014. Workshop and Performance from Hyper-listening: praxis at Overgaden Institute of Contemporary Art, Copenhagen, 13 February 2014. Post-Digital Research panel, transmediale 2014, Berlin, 1 February 2014. ‘Mind your own Dizziness’, Art Hack Day, transmediale 2014, Berlin, 29 January – 2 February 2014. Conversation at Sensing Cities aired on Resonance104.4fm, 31st January 2014. Presentation at ‘Literature, Media, Sound‘, Aarhus University, 28-30 November 2013. Presentation at Université Sorbonne Nouvelle 3, Paris, 13-14 November 2013. Interview taken by Mr. Mike Harding (Touch, London) aired on ‘Long Wave 6′ at Resonance104.4fm, 12th November, (recorded in Bergen, Norway). Presentation and performance at ‘Dirty Ear Forum‘, Marken 37 and Landmark, Kunsthall, Bergen Academy of Art and Design (KHiB), 1 November 2013. Workshop – ‘sound art im globalen kontext’, Berliner Künstlerprogramm des DAAD, 23 October 2013. Workshop/presentation at Kunsthal Aarhus, Post-digital Research, Digital Aesthetics/Participatory IT Research Centre, Aarhus University & reSource transmedial culture berlin/transmediale, October 2013. Presentation from project ‘Post-cinematic Sound’, IASA-BAAC Conference, Vilnius, Lithuania, October 2013. Publication: article appears in Journal of Sonic Studies. Vol. 4, Issue 1. Solo exhibition: The Room within a View, the Widget Art Gallery, May 15th – June 15th, 2013. Group exhibition: The Well Tempered City, Spazioersetti Gallery, Udine, Italy, May 25th – May 26th, 2013. Teaching course: ‘Sound Design for film and video: course in production (sound/digital media)’, Department of Media, Cognition and Communication, University of Copenhagen, Spring term 2013. Release: elegy for Bangalore, CD, Gruenrekorder, Germany, March 2013. Publication: Interview appears at ’In the Field: The Art of Field Recording‘. C. Lane & A. Carlyle (eds). Uniformbooks. February 2013. Publication: article appears in SoundEffects -Interdisciplinary Journal of Sound and Sound Experience, vol 2, no. 2. February 2013. Dirty Ear Forum, sound, multiplicity and radical listening, Errant Bodies, Berlin, (reSource 003: P2P Vorspiel, Transmediale 2013); Workshop: January 19th – 20th, 2013; Opening: January 26th, 2013 – 7pm; Exhibition: January 27th – February 3rd. Presentation: Post-cinematic Sound at EXPRESSION, SENSATION, MEDIATION, Copenhagen, December 2012. Presentation at RE-NEW Digital Arts Festival / IMAC Conference, Aalborg University, Copenhagen campus, 21 November, 2012. Solo exhibition: ‘Dismantling a Sound-work in Six Easy Steps‘, Akusmata Gallery, Helsinki, 20 October – 16 November 2012. Teaching course: ‘Art of Sound in Cinema: course in cinematic sound studies‘, Department of Media, Cognition and Communication, University of Copenhagen, Fall term 2012. Artists’ Talk and Live Performance, Cinemateket, CPH PIX, Copenhagen, 1 September 2012. Concert, SOUND//SPACE, SoundFjord, London, 15 July, 2012 Visiting Scholar, University of California Santa Cruz, June -July, 2012. Presentation: Sonification of Cinema at Music & The Moving Image conference, NYU, New York. June, 2012. Collaborative Installation-Performance, Clone Wars, City Hall, Copenhagen, 29 February, 2012 Concert, Byens Lys, Copenhagen, 21 February, 2012. Joined as PhD Fellow at Department of Media, Cognition and Communication in University of Copenhagen, 1 October, 2011.
concert at Blipfonica, 23rd September 2011, 8 PM. Phonophon concert series, Institut für Neue Medien (INM), Frankfurt AM, 7th September 2011, 8 PM. Artist in Residence at School of Music, Bangor University (supported and funded by British Council and Charles Wallace India Trust), July- September 2011. Release: Eye Contact with the City, Touch Music, London, June 2011.
this_location, sound installation, Studio 21, CIMA (Centre for International Modern Art), Kolkata, April, 2011. Live show, Jaaga, Bangalore, 19th December 2010. Artist in Residence at Jaaga, Bangalore, October – December 2010. ‘audible absence’, sound installation, ‘In Other Words’ exhibit, Select II, Bangalore, 3 – 5 October 2010. Live performance, SAMUHA gallery, Bangalore, 20 August 2010. Conducting workshop: “Sound, Environment and Space” at SAMUHA gallery, Bangalore, 19-20 August 2010. Artist in Residence at BAR1, Bangalore, July- September 2010. Artist’s talk: ‘Music of Sonic Space’ at Studio 21, CIMA (Center for International Modern Art) in Kolkata on 1st July 2010. Review of the event at The Telegraph. ‘A Landscape in Metamorphoses’, Media Archival project – fieldwork, supported and funded by Prince Claus Fund, Amsterdam, January 2009 – February 2010. ‘The Four Corners’, sound installation, ‘Nature of The City’ group show, Religare Arts Gallery, New Delhi, 16th December 2008 – 12th January 2009. Concert Tour: Elements, Berlin-Dresden-Hamburg-Arhus, 2008-2009. Release: ‘Landscape in Metamorphoses‘, CD, Gruenrekorder, Germany, 2008. ‘Passage’, sound installation, Private Flat 4.1, Florence, June 2008. ‘San Lorenzo’, sound installation, Palazzo Medici Riccardi, Florence, May 2008. Live concert, Wanderlust, Frankfurt AM, 2006.